If your blog’s or web site’s visitors enjoy Christian hymns or contemporary Christian art, we’d be honored if you would place a link to Hymnscript.com from your Web site. Please link directly to the home page, http://www.hymnscript.com. Display Hymnscript.com in its own window, not a frame. Use only the text and/or banners provided below. Do not modify Hymnscript.com banners. Download and place Hymnscript.com banners on your own Web server. Do not state or imply any sponsorship of your site by us. Vibrant color and lively form are the hallmarks of Hymnscript, the art of digital artist Diana Wolverton. 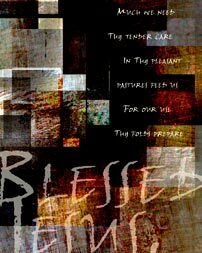 Hymnscript's original fine art prints, apparel, and gifts are fresh, new expressions of worship and witness. Right-click on a banner to save it to your computer (Mac users, click and hold). Choose "Save picture as" from the menu and save it in the same folder as your other Web site files. Then copy and paste the accompanying code into the body of your HTML document. (You will have to modify this code if you save the image in a different folder than that of your HTML page.) Upload the revised HTML file and the banner to your Web site.